Emergency personnel at the scene of the Bedford Square construction site where workers were injured Wednesday when scaffolding collapsed. Two construction workers at the Bedford Square project were injured Wednesday afternoon when the scaffolding where they were working collapsed. The incident took place about 3:30 p.m. when the two workers, preparing to cut steel on the second floor of the Post Road East work site, were hurt when scaffolding where they were setting up gave way, according to the Fire Department report on the incident. One worker was on the scaffolding and the other was hit by it, officials said. They both suffered leg injuries that were described as non-life-threatening. 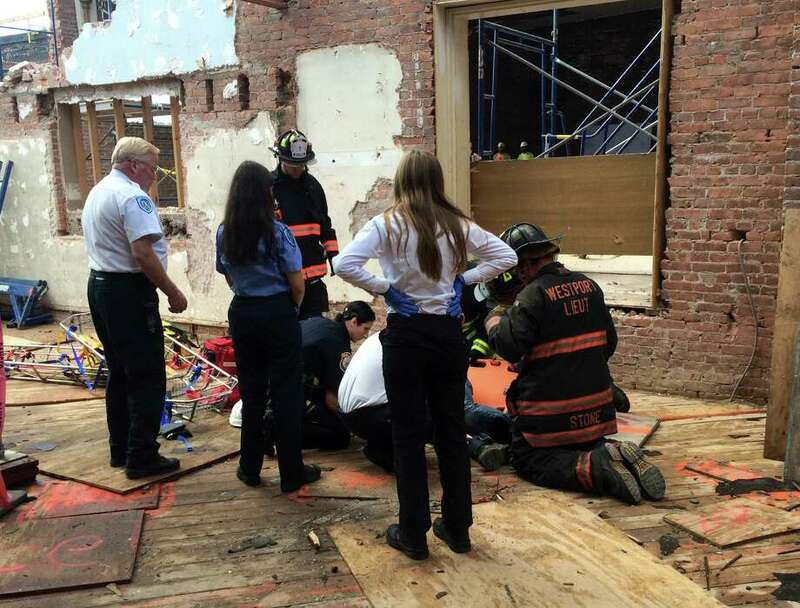 Westport EMS personnel and police were dispatched to the scene and provided primary patient care, while firefighters used ropes and rigging to lower the workers from the second floor of the structure. The workers were taken to Norwalk Hospital for additional treatment. The Fire Department dispatched 11 firefighters and an officer on Truck 1, Rescue 3, Engine 6 and Cars 3 and 5. Personnel remained on the scene for about an hour. The accident is being investigated by the state Occupational Health and Safety Administration.